Figure 1: Military Merit Cross, third class, Jeweled Version. Image from the authors archive. which were authorized by statute were: The Knights Order of the Golden Fleece, Military Maria Theresia Order, the Royal Hungarian St. Stephan Order, the Imperial Austrian Leopold Order, the Order of Franz Joseph and the Military Merit Cross. These jeweled awards were not a special class of the awards noted above but rather constitute a sign of the special esteem or regard the emperor had for the recipient and their service to the empire. These awards were paid for by the emperor out his personal funds and were conferred by him on the recipients. There were four additional awards that were occasionally issued in a jeweled version. These awards were issued in all cases with the exception of one by the emperor without regard for the statutory restrictions. Awards known in this category, which were authorized by the emperor, are the Officers Military Service Cross, first class as issued from 1890-1918, the Commemoration Badge of the Field-Marshal Archduke Albrcht, issued in 1899 and the Civil Merit Cross in Time of War, issued in 1917. 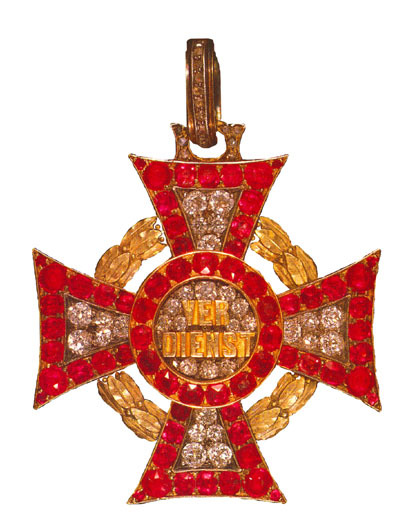 The one jeweled award issued without the express approval of the emperor was the Army Homage Cross, issued in 1908. What follows is the third of four blogs on the jeweled awards. This blog will describe the jeweled examples of the Order of Franz Joseph and the Military Merit Cross. 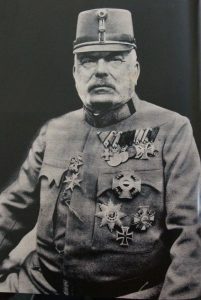 Order of Franz Joseph: Although the statutes of this order authorize the wearing of jeweled insignia with the permission of the emperor there are no known authorized full size examples of this insignia. Miniature examples are known but the author has not seen to date any officially issued examples of the full size insignia. Figure 2: Military Merit Cross, third class with war decoration, Jeweled version. Image from the author’s archive. The Military Merit Cross was issued from 1849 through 1918. There do not appear to have been any jeweled crosses issued from 1849-1860. 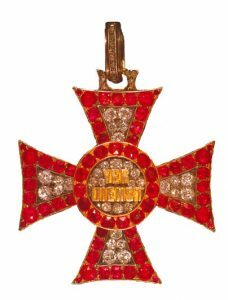 From 1860-1914 there were 20 jeweled crosses awarded. 11 crosses were awarded with war decoration and 9 crosses without war decoration. Many of these crosses were issued in 1898 on the occasion of the 50th anniversary of the reign of Emperor Franz Joseph. From 1914-1918 there were 12 jeweled crosses awarded. 5 First class crosses were awarded with war decoration and 3 crosses with war decoration and swords. There were no second class jeweled crosses awarded. There were 4 jeweled third class crosses awarded, 3 of which were awarded with war decoration and 1 with war decoration and swords. Figure 3: Archduke Eugen wearing the Jeweled Military Merit Cross First Class with war decoration and swords. Image from the author’s archive. I hope you have enjoyed this discussion. I look forward to sharing with you in the future. Until next time I hope you enjoy the adventure of medal collecting and the research that goes with it as much as I do.